"Kiamichi Country" was the Oklahoma Department of Tourism and Recreation's official tourism designation for Southeastern Oklahoma until the name was changed to Choctaw Country in honor of the Choctaw Nation headquartered there. The current definition of Choctaw Country includes ten counties, being Coal, Atoka, Bryan, Choctaw, McCurtain, Pushmataha, Le Flore, Latimer, Haskell, and Pittsburg Counties. The Department created the term as one of six designated travel regions within the state. However, other definitions of Southeastern Oklahoma may include additional counties. The name of Kiamichi was actually applied by early French explorers who came to the area in the early 18th Century. They discovered, among other things, a very large, noisy woodpecker that they called Kiamichi, their word for "raucous bird." 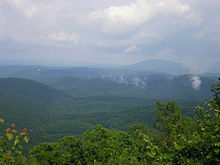 The area also contains the Kiamichi Mountains, a subset of the Ouachita Mountains. Due to an influx of southerners seeking less expensive frontier lands during the post- Civil War Reconstruction era, Kiamichi Country is more southern in culture than the rest of the state, and hence the same general area has also been called " Little Dixie". Lightly populated, heavily mountainous and forested, the region is popular for outdoor recreation like water sports, mountain biking, hiking, hunting, horse back riding, fishing, and national scenic drives. The Choctaw Nation of Oklahoma covers much of the area. The area was acquired by the United States through the Louisiana Purchase and became part of the new Arkansas Territory. On April 1, 1820, Arkansas created Miller County which included most of the land that would become Little Dixie. A post office at Miller Courthouse was established on September 7, 1824. Per a treaty signed on January 20, 1825, the land west of a line "one hundred paces east of Fort Smith, and running thence, due south, to Red river" was ceded to the Choctaw Indians. The residents west of the line made a futile attempt to be exempted from the treaty but failed. They burned the courthouse and most of the records before they left. Some Choctaws had been moving into the region from Mississippi since the Treaty of Doak's Stand in 1820. Following the Treaty of Dancing Rabbit Creek in 1830, the federal government began their forced removal. By 1834, nearly 8,000 Choctaws had arrived in their new land over the "trail of tears and death". At Nanih Waiya, near the present Tuskahoma Council House, they established a capital and adopted the first constitution ever written in what is now Oklahoma. The Choctaws actively supported the Confederacy during the Civil War and were allowed to keep most of their land in eastern Indian Territory. In 1898, after pressure from Washington, they agreed to an allotment plan administered by the Dawes Commission. Their excess lands and those of the allied Chickasaw were opened to settlement by non-Indians. The damage of the Civil War and a long decline in cotton prices meant years of a poor economy in the mostly rural South. Many citizens left the South to seek opportunities in new western lands. When the Indian lands were opened, Southerners flocked to the Indian Nations for a new start, especially to the old Choctaw reserve. So many homesteaded in the area that they markedly influenced the politics and culture of the region. They made much of what is now Oklahoma culturally a southern state. In the decades that followed, this area became known as Little Dixie. Southeast Oklahoma is far more mountainous and forested than any other part of the state, containing most of the Ouachita Mountains in Oklahoma, the Arbuckle Mountains, and five other mountain ranges. The Ouachita National Forest, Oklahoma's only national forest, is also in this area. The region contains Oklahoma's largest lake by surface area, Eufaula Lake. Other major lakes include Robert S. Kerr Reservoir, Sardis Lake, Hugo Lake, McGee Creek Reservoir, Pine Creek Lake, Broken Bow Lake, Lake Wister, Lake Atoka Reservoir, and on Kiamichi Country's southwestern border, Lake Texoma. The region consists of the following counties in Oklahoma: Atoka, Bryan, Choctaw, Coal, Haskell, Hughes, Johnston, Latimer, Le Flore, Marshall, McCurtain, Pittsburg, Pushmataha. The region is overwhelmingly Democratic—around 80%. Many of the citizens proudly refer to themselves as yellow-dog Democrats. However, this region has been swept up in the growing Republican trend in Oklahoma. Many register as Democrats to vote in primaries then vote Republican in general elections. From statehood until 2003, most of the region was in its own Congressional district, the 3rd District (numbered the 4th District from 1907 until 1915). Its best-known congressman was Carl Albert, from McAlester, who represented the district for 30 years, the last six as Speaker of the House. Albert became synonymous with the region. At 5 feet 4 inches (1.63 m) tall, he was known affectionately as the Little Giant from Little Dixie. Albert retired in 1977 and was succeeded by Wes Watkins, who held the seat for 14 years. He decided to run for governor in 1990. However, the Democratic campaign tactics during the primary forced Watkins from the race (and eventually from the Democratic Party). Watkins later shifted his party affiliation and registered as a Republican. In 1996, he easily won back his seat on the strength of his personal connection with the region's voters, becoming the first Republican to win this seat since statehood. Watkins’s victory led to several other Republican victories at the local level in the region. After the 2000 U.S. Census, Oklahoma lost one seat in Congress. Most of the Little Dixie region was combined with northeastern Oklahoma to become Oklahoma's 2nd congressional district. The region remains strongly Democratic politically. However, most of the Democrats in this region are fairly conservative by national standards, and a majority of Native Americans generally line up with the Republican Party on issues of abortion, marriage, gun-rights and national security. From 2005 to 2013 it was represented in Congress by Dan Boren, son of former Oklahoma governor and United States Senator David Boren. According to the Chicago Tribune, among House Democrats, Boren of Oklahoma backed former President George W. Bush most often, with 77.9 percent of his votes, a higher score than 26 House Republicans could claim. Markwayne Mullin, a Republican from Westville, currently holds the seat and is only the second Republican to do so since 1921. A view from Talimena Drive. Kiamichi Country bills itself as the "Deer Capital of the World." Main tourism draws include award-winning scenic drives through the Ouachita Mountains, 13 major lakes, the nearby Chickasaw National Recreation Area, state parks, and whitewater rapids sports. The Talimena Scenic Drive is also among the top draws, traveling through the Ouachita National Forest in the Winding Stair Mountains. Per the 2000 census, the region had 305,395 people. Whites equal about 76% of the total, American Indians total a little over 17%, and Blacks, almost 4%. Many of the blacks are descendants of the Choctaw freedmen (slaves held by the Choctaw and freed after the Civil War). The median per capita income is $13,948, almost $10,000 less than the state average of $23,517. The city of McAlester serves as the region's primary urban center. Culturally and economically, it is a suburb of the more heavily populated cities of Green Country in Northeastern Oklahoma. Another major urban center that lies to the south is Durant, which is ranked as one of the fastest growing cities in the United States. Other important cities and towns include Atoka, Poteau, Hugo, Idabel, Broken Bow, Talihina, Clayton, Antlers, Coalgate and Wilburton. ^ "Welcome to Hugo." K-Ten CommunityInfo - Hugo, OK. Retrieved August 8, 2014.